Over the last 150 years, how humans spend their time has changed quite drastically. As the chart above shows, the amount of time humans spend working has been on a steady decline over the last century and a half. 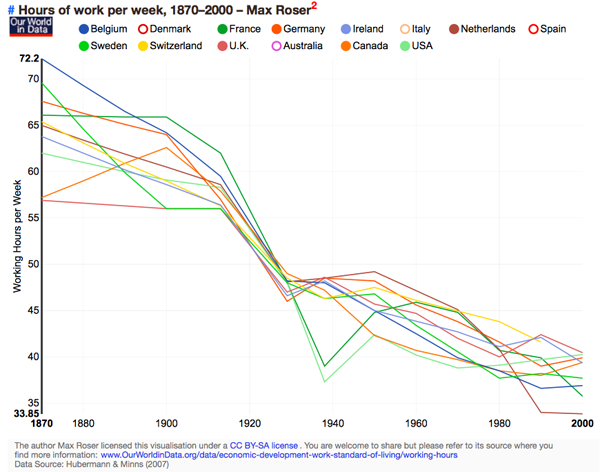 by In most countries, the typical work week has dropped by approximately 30 hours over the last 150 years. On average, humans live 75 years. That?s about 3,900 weeks. Or 27,000 days. Or 648,000 hours. We spend about a third of that time sleeping, and that number hasn?t changed over the last century. What has changed drastically is how we spend our time when we are awake.